Joumaa, who is now four years old, used to be so conscious of his hand. Even when he was laughing and giggling he would hide his hand away, aware of the burns that used to prevent him from even holding a pencil. On the day of the injury, when Joumaa and his mother were fast asleep there was a nearby airstrike. It was very distant and they didn’t hear anything at that moment, until shrapnel caused their gas canister to explode. All of a sudden, their entire apartment was on fire. Joumaa’s mother didn’t have any time to think; she had to act on impulse. Her life was in danger and so was her son’s. She covered herself in blankets to put out the fire that was burning her face and neck, and grabbed her son, running as fast as her feet could carry her. When she finally got outside she threw her son into the water tank to put the flames out. She pulled him out, took a few steps, and fainted from the exertion. Both of them were badly burnt. Their neighbors took them to a local hospital to get treatment and also contacted Hussein. When he heard about what happened, he came back to Syria immediately to visit them in the local hospital and do whatever he could to help them. He was shocked at how little the hospital was doing to treat their severe burns, largely due to how poorly resourced it was due to the ongoing war. He knew that he would have to get them to Damascus to get the proper help they deserved. Once in the capital, Joumaa had a skin graft surgery on his hand. The burns on his hand had caused his fingers to fuse together, badly restricting the child’s movement. However, the operation failed and the child’s scars tightened even more around his hand, twisting it to one side. We introduce Joumaa to doctors at the American University of Beirut Medical Center (AUBMC) - who informed us that the three-year old boy will need a number of surgeries on his hand. First he had wires placed into his fingers to straighten them out, as they were twisted from the surgery that went wrong in Syria. After this, he had a scar revision surgery to separate his fingers, restoring mobility to his hand. His last surgery was in August 2017, and he has been coming in for follow-up appointments to ensure that mobility has been fully restored for a number of months. 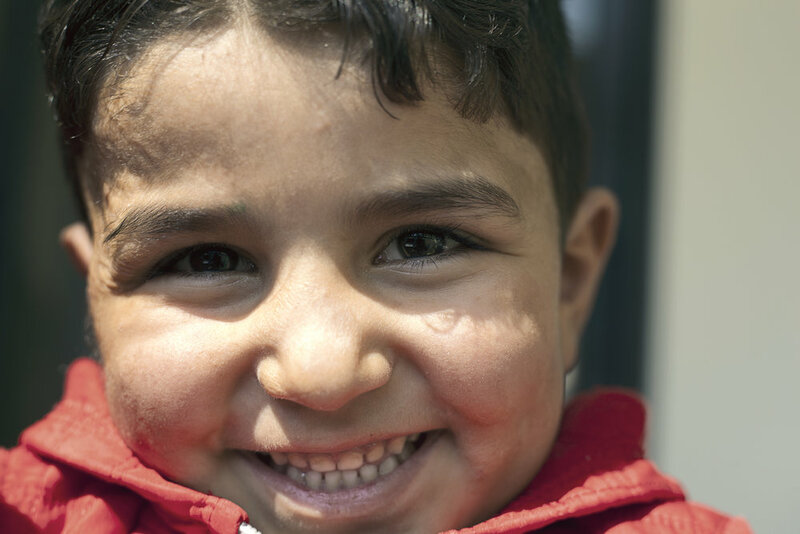 Now that he has completed his INARA treatment, his parents are looking forward for him to start school. Now that he can hold a pencil in his hands, they’re starting to try to teach him the alphabet at home as he’s still too young to go to school. UNICEF contributed to Joumaa's treatment.